Be Brave, Keep Going: Sea World San Diego's New Show: Madagascar Live! 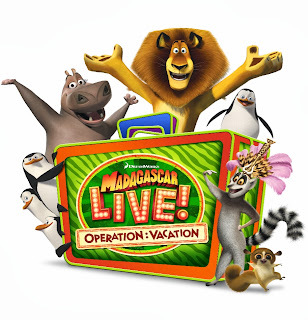 Sea World San Diego's New Show: Madagascar Live! Planning a trip to San Diego soon? Put Sea World San Diego on your list of things to do in San Diego. Located a few minutes north of downtown San Diego, Sea World has so much to see an do for all ages....From the Sesame Street Bay of Play perfect for the littlest park goers to the night time "dance club" Atlantis for teens to Shamu of course. The Madagascar Live! show features some of your favorite characters from the hit movie and cartoon series as well as some new friends. The show is a super fun time and carried by some engaging and talented singers and musicians. Of course those pesky penguins make an appearance as do Marty, Gloria and the fabulous King Julian. It was a little loud at one point so if you are hearing sensitive, sit toward the middle/back. What's your favorite animal exhibit, show or ride at Sea World Sn Diego? Disclosure: We were invited to Sea World San Diego as a guest of the park to get a sneak peak of the opening of the Madagascar Live! show. All opinions are my own. I was not paid to write this post.